Benjamin Thomas Cook came to Berrien County, GA after the Civil War and settled on land near Empire Church, not far distant from the grist mill Thomas M. Ray and Levi J. Knight had established on Beaver Dam Creek, a tributary of Cat Creek in southern Berrien County. Cook was a veteran who had been a prisoner of war, and came to Berrien to join others of the Cook family connection. Benjamin Thomas Cook was born in Georgia in 1842, a son of Martha Knight and John Cook. 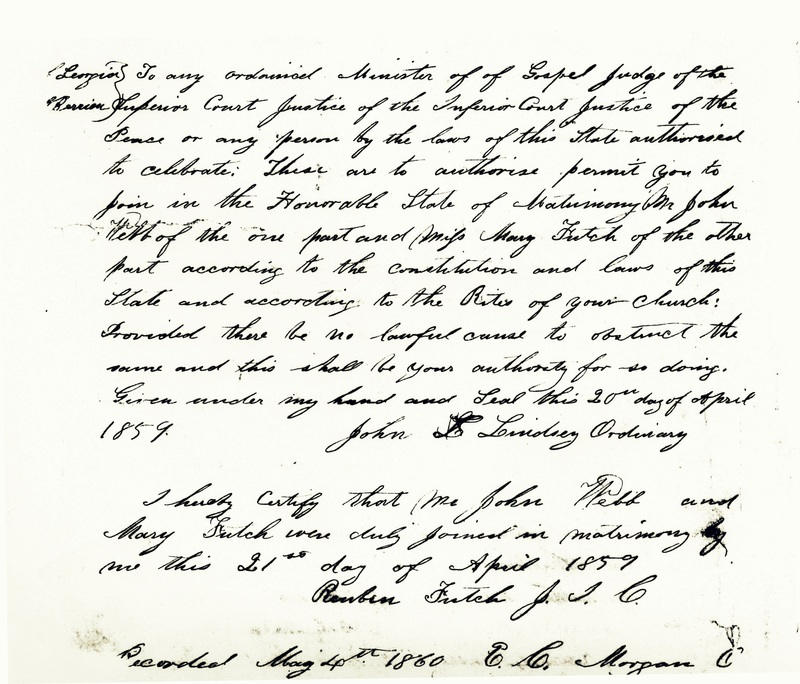 His parents were married December 5, 1841, in Wilkinson County, and Ben was first enumerated at eight years old on his father’s farm in the 1850 census of the county. 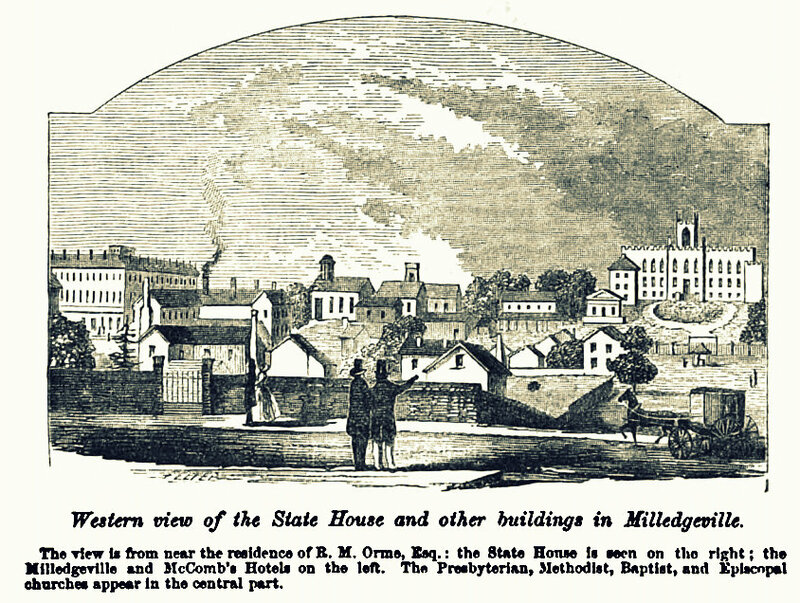 Western view of the State House and other buildings in Milledgeville. At the age of 20, Benjamin Thomas Cook was a resident of Milledgeville, Georgia, of florid complexion, dark brown hair, hazel eyes, and 5 ft, 3 3/4 inches tall. When the Civil War got underway Benjamin and his brother, Henry Cook, joined the Confederate cause. He enlisted May 1, 1862, at Macon, GA with Company A, 1st Confederate Georgia Regiment, according to the Confederate Pension application he later filed. He appears in the National Park Service database of Civil War Soldiers and Sailors as a private of Company A, 1st Georgia Reserves. There were over thirty Georgia battle units incorporating the “First Georgia” title, so Benjamin’s unit service record remains unclear. Those who were residents of Georgia at the time the Ordinance of Secession was passed were implicitly no longer citizens of the United States, but citizens of the State of Georgia. After the passage of Secession, anyone who came from a Union state to reside in Georgia was required to take the Oath of Abjuration, an explicit statement renouncing their American citizenship. While in Confederate service, Benjamin Cook was captured at Milledgeville, GA. 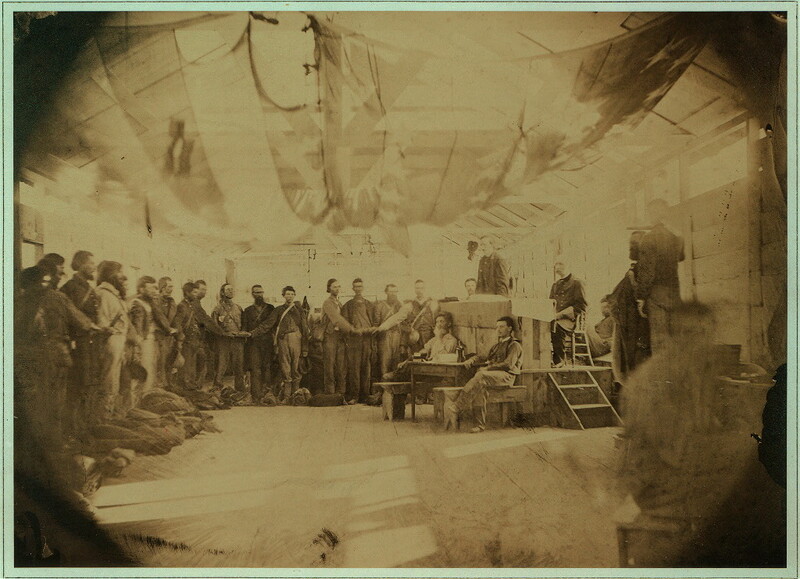 The Roll of Prisoners of War at Point Lookout, MD shows he was captured November 23, 1864, and held as a POW at the federal prison there at Point Lookout, MD. His brother, Henry Cook, was also among the POWs at Point Lookout, as were John A. Gaskins, John T. Ray, Benjamin Harmon Crum and Aaron Mattox of Berrien County, GA.
Point Lookout had been hastily constructed in 1863 to confine Confederate prisoners of war captured at Gettysburg. Following the Confederate surrender, B.T. Cook swore an Oath of Allegiance to the United States, and was released from Point Lookout on June 10, 1865. It appears from the Point Lookout records that B.T. Cook was transported to Hilton Head, SC arriving on July 1, 1865. After the War, Ben and his brother, Henry, came to Berrien County, GA. In doing so, Ben and Henry were joining about a dozen or so families originating from Wilkinson county who had made the move to the newly established Berrien County some ten years earlier. These included the families of Ben’s cousins Elijah, Tabitha, and Piety Cook. Tabitha married Daniel Avera and Piety married Nicholas Lewis, both of these couples moving to Berrien. Dawson Webb, father of Elijah’s first wife, had also moved to Berrien around 1856, and Webb’s daughter Louisa Eliza Webb and son-in-law Moses G. Sutton came to Lowndes County (now Berrien) a few years prior. 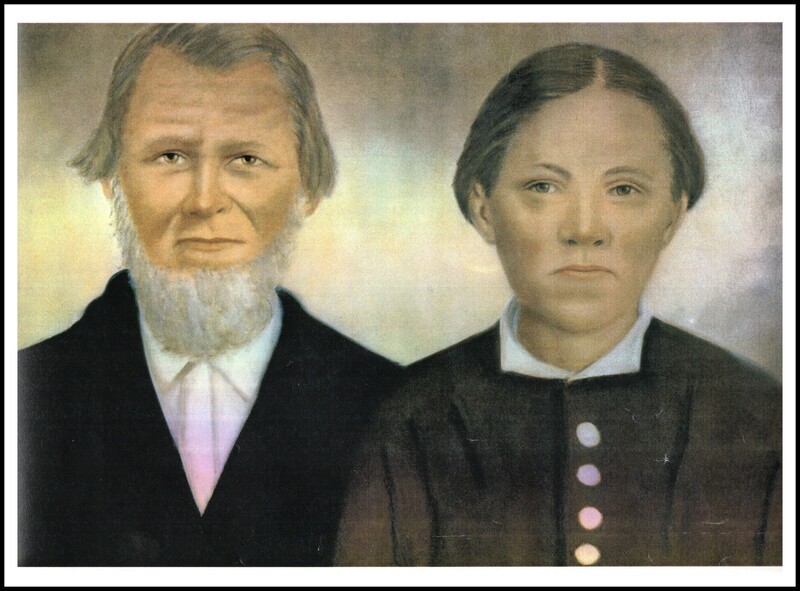 In Berrien County on 14 December 1865, Ben married Samantha Jane “Mantha” Taylor. Jane was the daughter of blacksmith William Jackson Taylor and his wife, Samantha Jane Rogers, originally from Marion County, SC. The marriage ceremony was performed by Jane’s brother, Thomas L. Taylor, Justice of the Peace. Congress passed the Reconstruction Act in 1867 requiring the former Confederate states to ratify the 14th Amendment, which “defined all persons born in the United States as national citizens, who were to enjoy equality before the law.” States were compelled to adopt new state constitutions, providing “equal protection of the laws” to all national citizens, black and white. Southern states which continued to deny the vote to black men would lose representation in Congress. 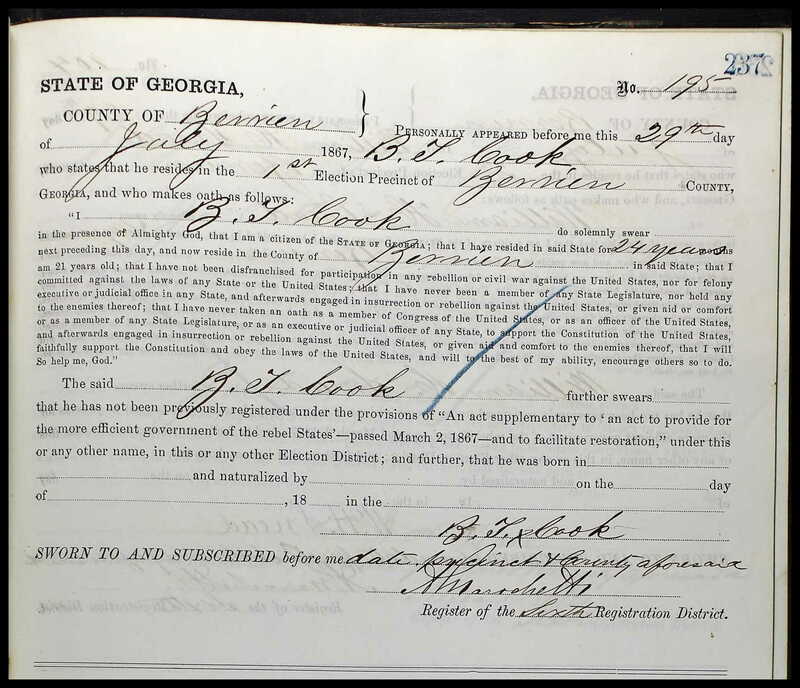 By 1867, white Georgia voters were required to complete the Oath of Allegiance in order to be listed in the register of qualified voters. White southern men whose national citizenship had been renounced by way of the Ordinance of Secession, oaths of abjuration of national citizenship, oaths of allegiance to Confederate states, or acceptance of Confederate citizenship were required to swear a new oath of allegiance to the United States in order to have their national citizenship restored and to qualify for the right to vote. Some whites who had held posts in the Confederate government or the governments of Confederate states were disqualified from having their citizenship restored through the oath of allegiance. 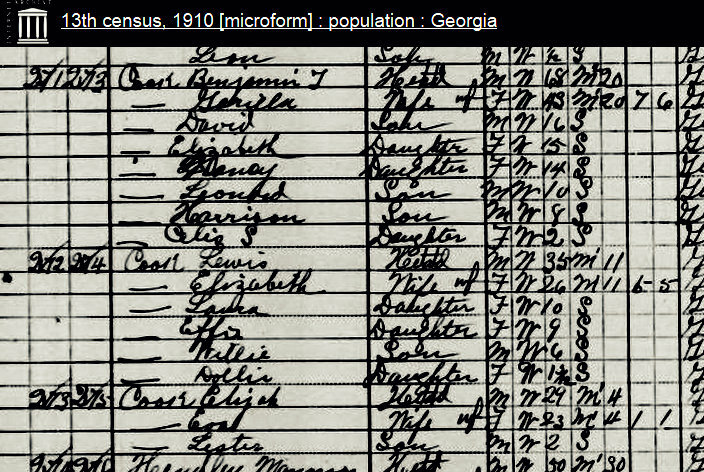 The 1870 census records show Benjamin T. Cook took up farming next door to his brother-in-law, Thomas L. Taylor, and cousin, Elijah Cook, in the 1148th Georgia Militia District. Ben owned $50 in real estate and $85 in personal property. Benjamin T. Cook was undoubtedly a cousin of Elijah Cook, although the exact relationship is not known. Like B. T. Cook, Elijah was a native of Wilkinson County, GA.
Around 1874 Benjamin Thomas Cook acquired 65 acres of Berrien County land on Lot 219 in the 10th Land District. About that time, Elijah Cook let go of his land on Lot 217, and acquired Lot 198 which was just to the north. In 1879, Benjamin T. Cook had 40 acres on lot 217, and Elijah Cook held 680 acres along Five Mile Creek, on Lots 217 and 198. Benjamin T. Cook in 1880 had 390 acres on Lot 215. In 1884 Benjamin gave up 160 acres on Lot 215, retaining 130 acres there. William Jackson “Jack” Cook – born March 13, 1867; married 1st Annie Laura Mathis (1871-1910), September 25, 1887; married 2nd, Nancy Barker; married 3rd, Carrie E. Sullivan (1878-1942); died February 1, 1951; Jack, Laura, and Carrie are buried Empire Primitive Baptist Church Cemetery, Lanier County, GA.
Samantha Jane “Mantha” Taylor Cook died on Thursday, June 7, 1888. She was buried at Empire Church Cemetery, about seven miles northeast of Ray City, GA. Grave of Samantha Jane “Mantha” Taylor Cook, first wife of Benjamin Thomas Cook. Empire Church Cemetery, Lanier County, GA. Image courtesy of Linda Ward Meadows. Just seven weeks after the death of Samantha Jane “Mantha” Taylor Cook, Benjamin T. Cook married his second wife, Arrilla “Sis” Stone. 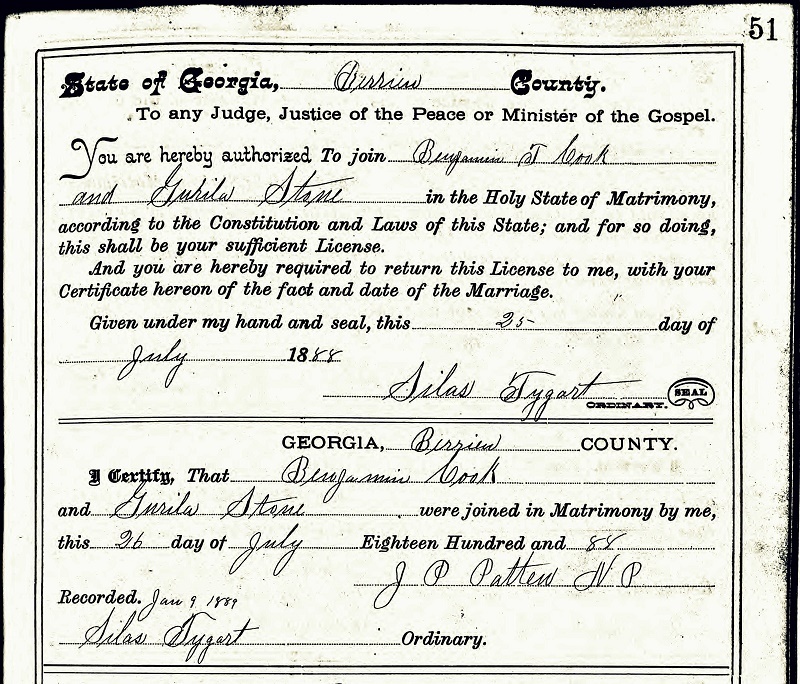 They were married on Thursday, July 26, 1888, in Berrien County, GA, the bride’s name appearing on the Marriage license as “Gurila” Stone. The marriage ceremony was performed by J.P. Patten, Notary Public. Arrilla was a daughter of Elizabeth Harris (1840-1929) and David Stone (1838-1899). The groom was 46 and the bride was 21; she was born in March of 1867. Her father, a Confederate veteran, served with the Okefenokee Rifles, Company G, 26th Georgia Infantry and was wounded in the abdomen at the Battle of Brawner’s Farm. 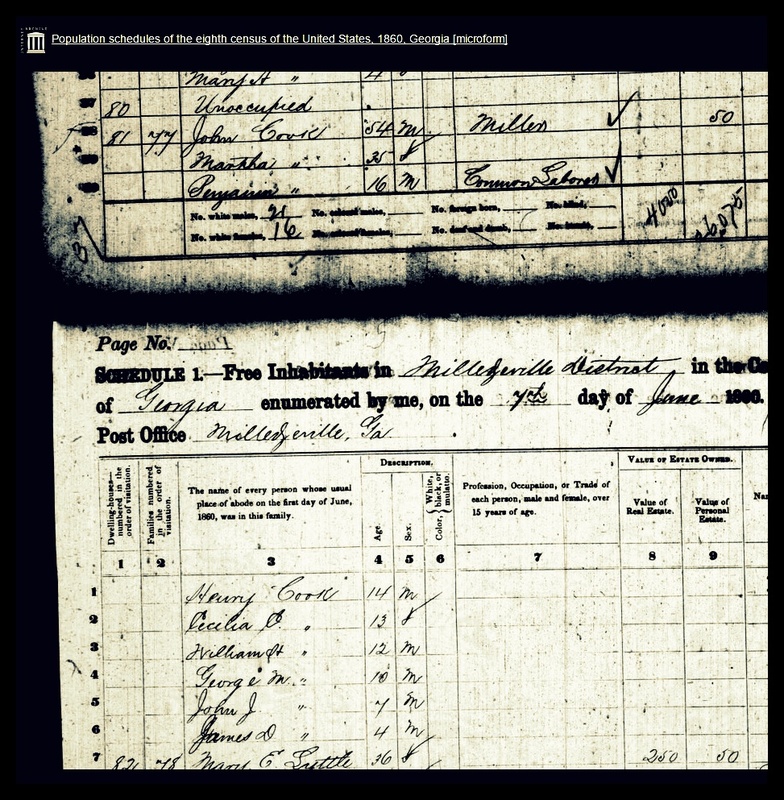 On January 29, 1898, Ben was enrolled into the Berrien County Confederate Veterans Association in Nashville, GA. Ben and Arrilla Cook appear in the 1900 Census in the 1300 Georgia Militia District of Berrien County, GA. In their household were four children: David (7), Elizabeth (5), Nancy (2), Leonard (1). Also living in the Cook home was Fannie Taylor; the census taker recorder her relationship to Ben as “Grandmother” but she was actually the sister of his first wife, Samantha Jane Taylor. Around their farm were the farms of their son, Lewis Cook, and their sons-in-law, Enoch Benefield and James Elijah Benefield. 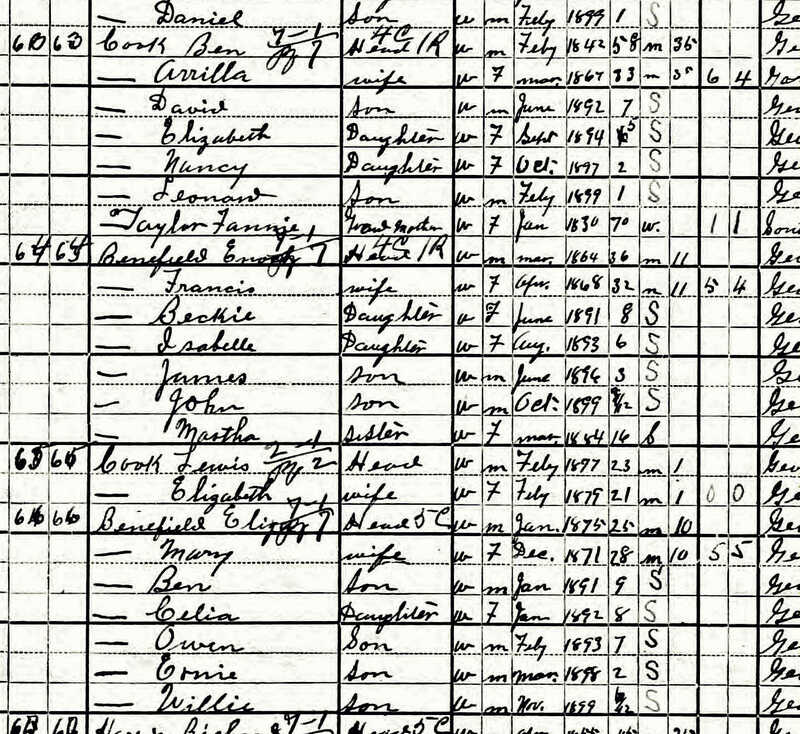 In the 1910 census records Benjamin T. Cook and Arrilla Cook appeared in the 1300 Georgia Militia District of Berrien County, GA; Arrilla was enumerated under the name “Gorilla.” Ben owned his farm, free and clear of mortgage. Ben and Arrilla were listed as parents of seven children: David (16), Elizabeth (15), Nancy 14), Leonard (10), William Harrison (8), and Celia Samantha (2). Some time between 1910 and 1920, Benjamin Cook became a widower for the second time. 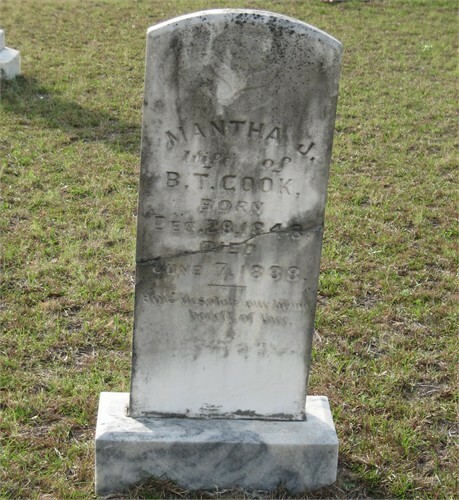 Arrinda Stone Cook was buried at Empire Church Cemetery, Lanier County, GA, near the grave of Benjamin Cook’s first wife, Mantha J. Taylor Cook. The date death came for Arrinda Stone Cook is not known; the marker for her grave bears only her date of birth. David”Dave” Cook – born June 22, 1891; married Lou Annie Gray6/22/1891; died April 1, 1957; buried at Empire Cemetery. William Harrison Cook- born September 13, 1902; married Mineola Smith (b.3/10/1904); Died February 1, 1967. both are buried at Empire. By 1918, B.T. Cook was 75 years old. He deeded 30 acres of his land on Lot 309 to his son, James Lewis Cook, and four . Quit Claim Deed, B.T. Cook to J.L. 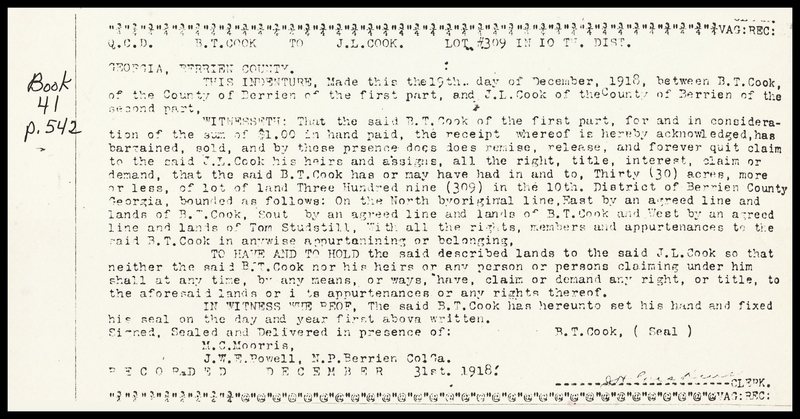 Cook, Lot #309 in the 10th District, Georgia, Berrien County. Image courtesy of Linda Ward Meadows. Warranty Deed, B.T. 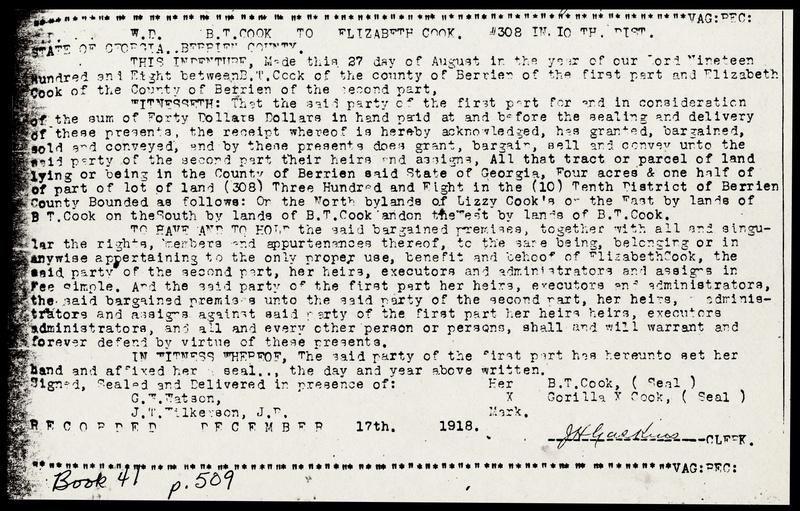 Cook to Elizabeth Cook, #308 in the 10th District, State of Georgia, Berrien County. Image courtesy of Linda Ward Meadows. 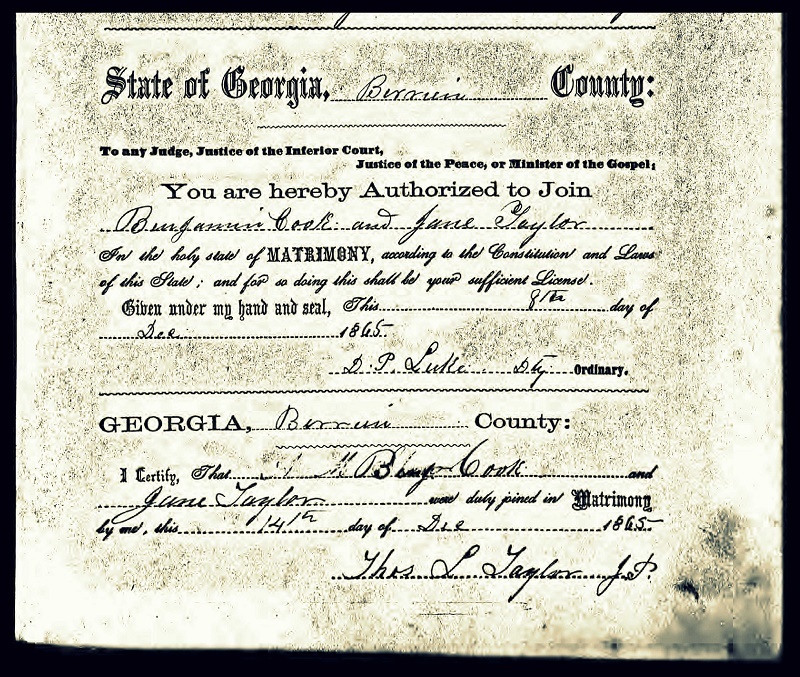 Benjamin T. Cook applied for a Confederate Veteran’s pension in 1919. His application for a pension was accepted, and he was awarded $6.00 a month. By 1920, Benjamin Cook was 77 years old. He was residing in the household of his son-in-law James Elijah Benefield and daughter Mary Cook Benefield. The Benefield place was situated on the Milltown & Willacoochee Road. Elijah was engaged in general farming with the assistance of his eldest sons, Willie and Eddie Benefield. Just down the Milltown & Willacoochee Road were the farm places of William J. Cook and Elijah Cook. Ben died at home on October 5, 1924. 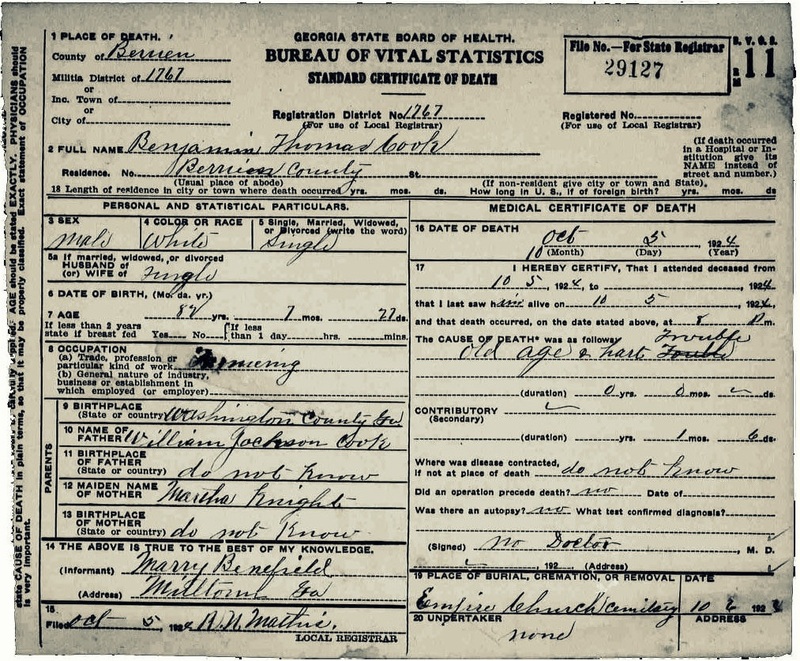 The certificate of death, filed in Berrien County, GA, gave his cause of death as “old age & heart trouble.” His daughter, Mary Benefield, was the informant and R. N. Mathis was the local registrar. There was no doctor in attendance to sign the death certificate or undertaker to handle funeral arrangements. Family members who remember Ben recall a man with a temper, who enjoyed family get-togethers, such as barbecues. He was a man who walked with a limp, which was the result of his breaking his leg when he fell from a barn roof. He rebroke it before it healed, thus the limp. Ben died at his home in the 10th district of the newly formed Lanier County sometime in the early part of 1924. He is buried between his two wives at Empire Cemetery. His home still stands as a reminder of the industrious man who came to Berrien County and carved a home for himself and his large family after the Civil War. Grave of Benjamin Thomas Cook, Empire Church Cemetery, Lanier County, GA. Image courtesy of Linda Ward Meadows. According to Folks Huxford, Elijah Cook was born in Wilkinson County, November 22, 1816. His father was James Cook, who was said to have come to Wilkinson from Effingham County. His grandson, Aaron Cook, served in the Spanish American War. Elijah Cook was married twice. His first wife was Sarah “Sallie” Webb. She was daughter of Dawson Webb and Frances Phoebe Beall, and a sister of John Webb. 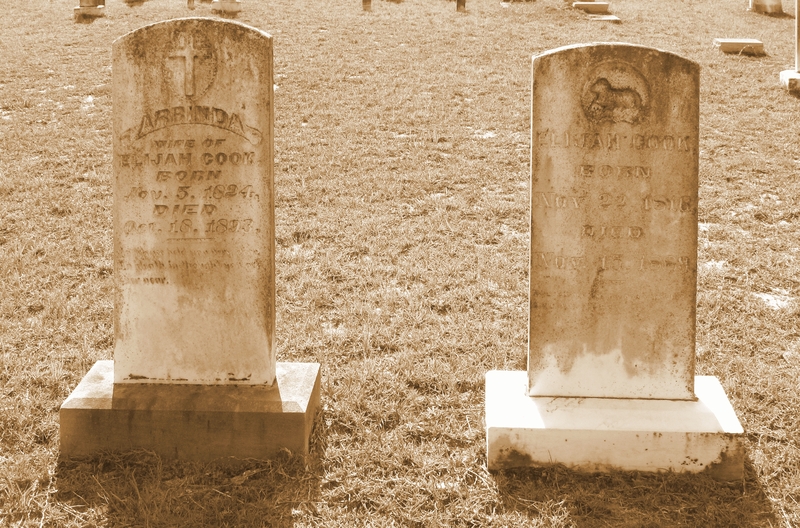 Elijah and Sallie were married in Wilkinson County, May 14, 1837. In their second year of marriage a child came to them; Maxie Jane Cook was born June 13, 1839. But with the delivery of her daughter, Sallie Webb Cook expired. Sallie’s parents moved with their remaining children to Lowndes County, GA some time before 1850. Elijah Cook married Miss Arrinda M. Chandler on Sept. 26, 1841 in Wilkinson County, GA. She was born November 25, 1824, a daughter of Pheriby and Aaron Chandler of Wilkinson County. Some time before 1850 Elijah and Arrinda moved from Wilkinson to Irwin County, GA.
About 1852, Elijah’s daughter Maxie Jane Cook, at just 13 or 14 years old, married Aden Boyd, Jr of Lowndes County (later Berrien). Aden Boyd, Jr was a son of Nancy Sykes and Aden Boyd, who gave land in 1854 to establish Empire Church, located on Empire Road near Five Mile Creek, about six miles northeast of Ray City out the Sam I. Watson Highway. Around 1856, about the time Berrien County was being created from land cut out of Lowndes County, Elijah and Arrinda Cook came to the area. They settled in the 10th district within sight of Empire Church, and became neighbors of their in-laws, the Boyds. The Cooks were one of a dozen or so families originating from Wilkinson county who made the move to the newly established Berrien County around that time, including the families of Elijah’s sisters, Tabitha Cook and Piety Cook. Tabitha married Daniel Avera and Piety married Nicholas Lewis, both of these couples moving to Berrien. Dawson Webb, father of Elijah’s first wife, also moved to Berrien. Louisa Eliza Webb, sister of Sallie Webb, had married Moses G. Sutton and came to Lowndes County (now Berrien) a few years earlier. In 1859, Elijah’s daughter Fairiby Cook married Thomas Lang Taylor. T. L. Taylor was a son of William Jackson Taylor and Samantha Jane Rogers, and a Justice of the Peace. Fairiby and Thomas established their homestead near her father’s farm on lot 218. 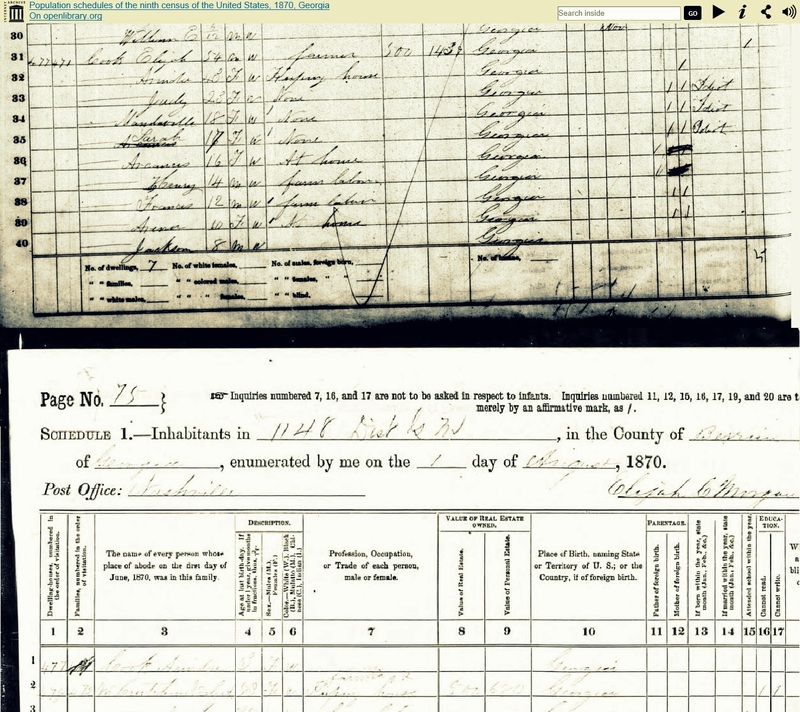 The 1860 population census shows Elijah and Arrinda Cook established their homestead near the farm of Elijah’s daughter, Maxie Jane, and her husband Aden Boyd, Jr. On the neighboring farms were William H. Boyd, Moses G. Sutton, and Stephen W. Avera, father of William Greene Avera. The 1860 Agricultural Census shows Elijah Cook’s farm consisted of 980 acres, 50 acres of which were improved. The farm was valued at $1200, and he owned $50 worth of farm equipment. His livestock, valued at $500, included two horses, a mule, two working oxen, six milk cows, 16 other cattle, 20 sheep, and 40 hogs. He had 150 bushels of Indian corn, and 30 bushels of oats, 1 bale of cotton, and 100 pounds of wool. He had $100 in stored meat, 50 pounds of honey and 5 pounds of beeswax. “The American Civil War began on April 12, 1861, when Confederate shore batteries under General Pierre G.T. Beauregard opened fire on Union-held Fort Sumter in South Carolina’s Charleston Bay.” Elijah Cook was 44 years old when the Civil War commenced, and did not himself enlist for service with the Confederate States Army. His eldest son, John Jasper Cook, served with Company I, 50th Georgia Regiment, but returned to his parent’s Berrien county farm and on October 9, 1864 married a neighbor girl, Lucretia Sirmans, a daughter of James Sirmans. After the War, Elijah Cook continued to work his Berrien County farm. The 1867 Berrien County tax records show Elijah Cook’s lands were on 730 acres of Land Lots 217 and 218, which straddled Five Mile Creek. Elijah’s daughter, Arkansas Cook, married William Hansford Hughes in 1872. W.H. Hughes grew up on a farm in the same district; He was a son of Irene Shaw Hughes, widow of Henry Hansford Hughes. Arkansas and William established their home on a farm near their parents. In 1872 Elijah Cook’s 740 acres of property on Lots 217 and 218 was valued at $1 an acre. His personal property was valued at only $568 dollars. His son-in-law, Aden Boyd, husband of Maxie Jane Cook, also owned 50 acres on Lot 217. Son-in-law Thomas L. Taylor, husband of Fairiby Cook, owned 147 acres of Lot 218. Aden Boyd’s sister, Sarah Boyd, and her husband Robert Lewis Taylor (brother of T. L. Taylor), were also on 50 acres on Lot 217. To the north Fisher W. Gaskins owned all 490 acres of lot 199. To the east, Mark R. Watson owned 1715 acres of adjacent land, situated on Five Mile Creek on Lots 197, 195, 172, and 173. To the southwest, Stephen W. Avera had 100 acres on Lot 243, and James Sirmans had 300 acres on the same lot. Around 1874 Elijah Cook let go of his land on Lot 217, and acquired lot 198 which was just to the north. Around that time Benjamin Thomas Cook acquired 65 acres on Lot 219. 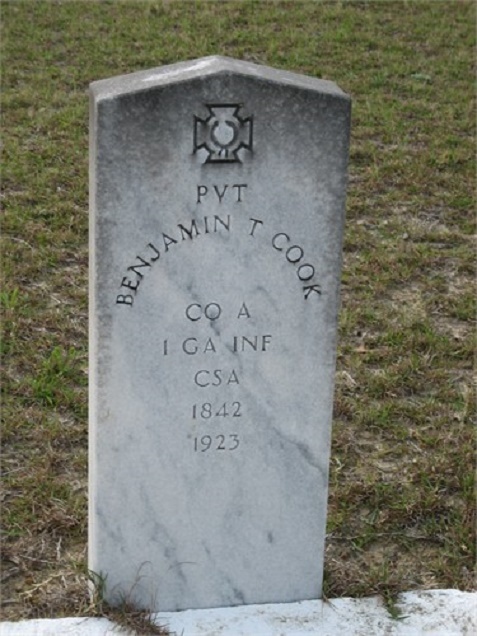 Benjamin T. Cook was undoubtedly a cousin of Elijah Cook, although the exact relationship is not known. Like Elijah, B. T. Cook was a native of Wilkinson County, GA; he came to Berrien County after the Civil War, a former prisoner of war at Point Lookout, MD. Elijah’s daughter Rachel Arena Cook married William Marshall Lewis in 1875. In 1879, his son Francis M. Cook married Anna J. Ford, and son Henry N. Cook married Mary Ann Boyd. Francis and Henry settled with their wives near their father’s place. By 1879, Elijah Cook had disposed of some 200 acres of his land, keeping 680 acres on Lots 217 and 198. This move gave him contiguous land all situated on the same side of Five Mile Creek. Benjamin T. Cook also had 40 acres on lot 217. 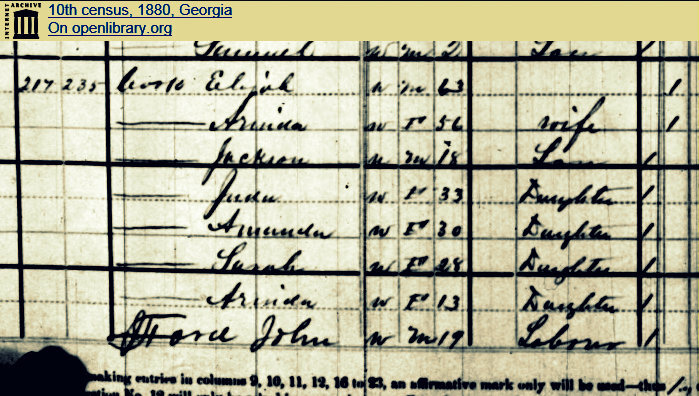 1880 Census enumeration of the family of Elijah Cook in Berrien County, GA. The 1880 population census shows Elijah and Arinda continued to provide care for their three disabled children, Juda, Amanda, and Sarah. Their youngest children, Jackson and Arinda continued to reside with them, as well as John Ford, who was a brother of Anna Ford Cook. Jackson and John provided the farm labor. By 1880, the old man had given up most of his land, retaining just 80 acres for himself on Lot 198. His son, Francis M. Cook had acquired 390 acres of the land on Lot 217, and 100 acres on Lot 198, and son Henry N. Cook had 100 acres of Lot 198. Benjamin T. Cook now had 390 acres on Lot 215. In 1882, Elijah’s youngest son Jackson J. Cook married Mary Melissa Lewis. She was a sister of William Marshall Lewis, husband of Rachel Arrinda Cook. Meanwhile, the Cook family land deals continued. Elijah had re-acquired 290 acres of Lot 217 in 1881. In 1882, in yet another family transaction, Elijah took back another 100 acres of the land on Lot 217, while son Francis M. Cook moved to 100 acres on Lot 198. The following year, Francis left Lot 198 for 125 acres on Lot 190. Elijah continued to hold 300 acres of Lots 198 and 217. Henry Cook stayed with his 100 acres of Lot 198, and Benjamin T. Cook remained on his 300 acres of Lot 215. By 1884, Francis Cook returned to 100 acres on Lot 198. Benjamin gave up 160 acres on Lot 215, retaining 130 acres there. Elijah’s eldest son, J. J. Cook, acquired 100 acres of the land on Lot 217, and Elijah retained 250 acres spread across Lots 198 and 217. Elijah had $75 in household belongings, $432 in livestock, and $20 worth of tools and books. Fairiby G. Cook, born 1846; married Thomas L. Taylor, 1859; died December 26, 1920; buried Poplar Springs Missionary Baptist Church Cemetery (about 8 miles northeast of Ray City, GA). Sarah J. Cook, born 1851, suffered from a crippling congenital disability, never married. Arkansas Cook, born November 13, 1853; married 1) 1872 to William Hansford Hughes, 2) July 20, 1909 to George Washington Nix; died December 24, 1911; buried Empire Primitive Baptist Church Cemetery next to her first husband. Henry N. Cook, born 1855; married Mary Ann Boyd, May 25, 1879; died May 14, 1940; buried Poplar Springs Missionary Baptist Church Cemetery (about 8 miles northeast of Ray City, GA). Rachel Arrinda Cook, born July 6, 1862*, married William L Lewis; died March 26, 1937; buried Poplar Springs Missionary Baptist Church Cemetery (about 8 miles northeast of Ray City, GA). But Elijah held on for another nine months. He died on his farm at Five Mile Creek on November 15, 1889. Arrinda Chandler Cook died October 18, 1893. They were buried in the cemetery at Empire Church of which they were members. Cane grinding in Berrien County, GA circa 1913 on the farm of Simmie King. Image courtesy of berriencountyga.com. Syrup, sugar, candy, and cane “beer” could all be produced right on the farm. J. L. Herring’s Saturday night sketches: stories of old wiregrass Georgia, published in 1918, illustrates how central this harvest “chore” was to the farming community. 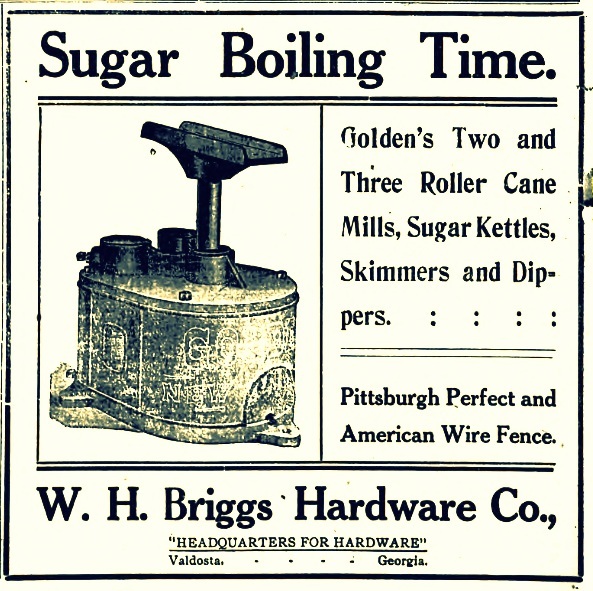 It is cane-grinding time in South Georgia, by some miscalled sugar-boiling time — although little sugar is made, and by others called syrup-boiling time, but it is not the syrup that draws the crowds. The cotton has been picked, the corn is in the crib, the potatoes have been banked and with the heavy work of the harvest over, the manufacture of the sugar cane into the year’s supply of syrup is made the occasion of a merry making among the young folks. This is down where the wiregrass covers the sloping hillsides and the pines still murmur and sigh in the passing breeze. The first frost has touched the waving blades of the tall sugar cane and given warning to the watchful husbandman. First the cane mill, which has lain idle for a year is overhauled. It is a crude affair, two big iron rollers set vertically on a pine log frame. The forest has been searched for a stooping sapling with just the right crook and this is cut and fitted in place for a lever, the lower end almost touching the ground, the upper swinging in the air as a balance. The iron kettle — like the mill rollers a product of a Georgia foundry — is set in a furnace of clay. Another day is spent in preparation. With wooden paddles, sharpened on one edge, the leaves are stripped from the standing cane. A stroke with a butcher or drawing-knife takes off the top and with an adz or hoe the stalks are cut. Then they are loaded on the handy ox-cart and dumped at the mill. The first shafts of coming dawn are aslant the horizon and the air is keen and cold when the faithful mule is led out and by means of the plow gear hitched to the lever’s end. Then for the animal begins the weary tread-mill round, which lasts far into the night. A lad of the family, too young for heavy work, Is selected to feed, and with home-made mits to temper the cold stalks, grasps a cane as the mule Is started. Between the slowly turning rollers he thrusts the smaller end; there are creaks and groans from the long unused mill, a snap of splitting stalk and the juice gushes forth. Along a small trough In the mill frame It runs Into a barrel, covered with layers of coarse sacking to catch the Impurities. On the other side of the mill the cane pulp (pummy) falls and this is carried off by the feeder’s assistant, who also keeps the pile of cane replenished. When there is a kettle full of juice a fire of lightwood Is started in the furnace and soon the flames, like a beckoning banner, surmount the short chimney’s mouth. As the juice boils the foreign matter arises in scum, and this is carefully skimmed off. Untiring vigilance in the boiling is the price of good syrup. Gradually the color changes from a dirty green to a rich amber and then to a golden red. The aroma arising suggests the confectioner’s workshop and soon tiny, bursting bubbles attest that the work is done. Then help is called and the fire drawn; hastily two men dip the boiling liquid into pails which are emptied into a trough (hewn from a cypress log) . As soon as the syrup is out, fresh juice which is ready at hand is poured into the kettle and the work goes on. As the shades of night fall, the neighbors, young and old, gather, for no man grinds cane alone. True, about as much is sometimes chewed, drunk in juice or eaten as syrup “foam” as the owner retains for his own use, but who would live for himself alone and what matter, so long as there is plenty for all? The first visit of the young people is to the juice-barrel. There, with a clean fresh gourd, deep draughts are taken of the liquid, ambrosial in its peculiar delicious sweetness. Then to the syrup trough, with tiny paddles made from cane peels is scooped up the foam which has gathered in nooks in candied form. Then, until the late hours of the night, the older folks sit around the front of the blazing furnace and swap yarns or crack jokes. By the light of a lightwood-knot fire near by the young ones play “Twistification,” “London Bridge” and many kindred games, while on the pile of soft “pummies” there is many a wrestle and feat of strength among the young athletes. The bearded men grouped around the furnace, the steaming kettle and its attendant, from whose beard and eyebrows the condensed moisture hangs; the shouts of laughter from the young merry-makers; the plodding mule making his weary rounds, the groaning mill and gushing juice form a scene not soon forgotten. In a few days when the “skimmings” ferment — there is cane beer, delicious with its sweet-sour taste, and still later “buck” from the same stuff, now at a stage when only the initiated can appreciate it, ready for the hard drinker or the wild-cat still. 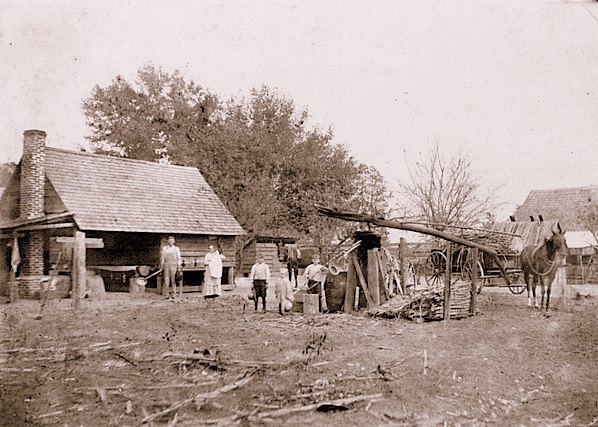 Although the prominence of the cane-grinding social event waned over time, on-the-farm production of cane syrup was a common practice well into the 1900s. One local Berrien producer was David Jackson Skinner (1898-1962). Skinner was a resident of the Ray City, GA area for most of his adult life, a Deacon of New Ramah Church, and spent his life farming in Berrien and Lanier counties. 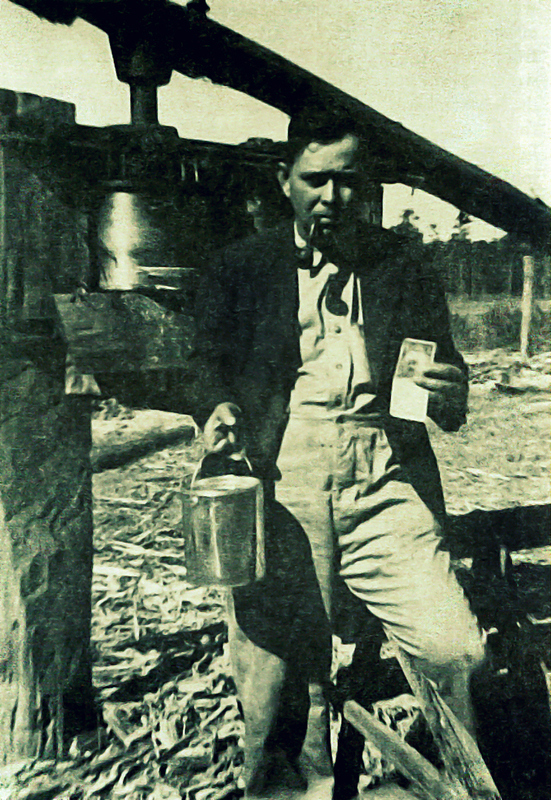 David Jackson Skinner with his sugar cane mill and bucket of Georgia cane syrup produced for market. In the 1920s David Skinner lived in the household of his father, Payton Shelton Skinner, located on the Upper Ray City – Milltown Road.